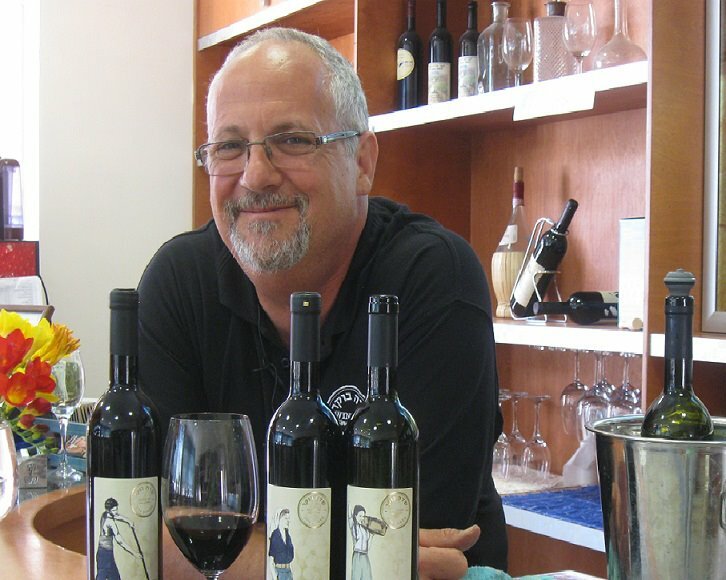 Zvi Remak does not complain about traffic jams, but once in awhile a car stops at Sde Boker’s gift shop to buy the excellent Cabernet Sauvignon and Merlot produced on the kibbutz. The wine is clearly Zvi’s baby. Back in 1994, he started dreaming of growing grapes in the Negev Desert. A year later he planted his first vines—four varieties grafted onto two different rootstocks. Eventually he harvested a small crop and made his first wine. A few years later, he, his wife Janet and their four daughters returned to Zvi’s native California so that he could study winemaking at Napa Valley Junior College. He supported the six of them by working any wine-related job he could find. The Negev, stretching south of Israel’s large cities, is a vast desert. It was not always so. Archaeologists dug up wine presses and other evidence that the Nabateans used here around 700 BCE. The region continued to produce wine during Byzantine times and a large farm or village flourished at Sde Boker itself between the late 7th to the early 9th century CE. Then the soil eroded. In 1952, a group of Jewish settlers started to wrest a living from the parched soil. With water brought in from afar they grew peaches, apricots, nectarines, pistachios and other fruit, but in time these crops proved unprofitable because of competition from Israel’s less arid Galil. The kibbutz kept looking for new crops, especially those that would grow on the newly discovered underground layer of brackish water. Small, sweet tomatoes, a harbinger of a soil appropriate for grapes, appeared to thrive. Grapes followed, though unfortunately they need fresh water. Sde Boker’s wine venture is still Zvi’s baby. He prunes the vines, controls their exposure to sunlight, tastes the sugar content and acidity of the grapes. Then he supervises their harvesting, destemming, crushing, fermentation, pressing, aging, bottling and many other steps involved in making superior wine. Finally Zvi proudly affixes a label created by his designer daughter Avigail. In today’s world nothing is simple. Recently, someone discovered that the small winery is outside the kibbutz commercial zone! Until this matter is straightened out, Zvi has to find temporary quarters elsewhere. Help, however, may be on the way. Kibbutz Sde Boker was the beloved home of Ben Gurion, Israel’s famous first prime minister. His modest abode, which is located across the street from Zvi’s winery, is now a tourist destination. Sde Boker hopes to build a small hotel to accommodate the flow of visitors to the Ben Gurion home, its small museum or those who want to experience the vastness of the Negev. This entry was posted in Uncategorized and tagged ben gurion, desert agriculture, israel, kibbutz, negev, sde boker, travel, wine, winemaking, winery. Bookmark the permalink.